Immersive Creatures and Revenge of the enemies compatibility patch with some extra adjustements for a more streamlined experience. I've made an advanced SIC - ROTE compatibility patch for personal use but sure could be great for anyone that uses those two great enemy mods together. It blends the leveled lists and some characters, but also tweak SIC NPCs for a more similar experience with boths mods. ROTE current version (2016) was greatly polished, most of the creatures modded here have a level relative to yours, and have dynamic perks to control that the damage output, along with other perks/skills to make things more interesting (or dangerous). 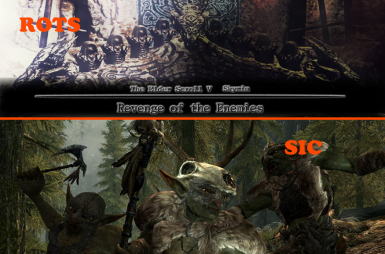 SIC is partially de-leveled, and has a MASSIVE pool of NPCs, but the damage output and health pools are not consistent between many creature types and also creature levels. Many creatures don't do any relevant damage at any level, while some low-level creatures can 1H-2H kill you because of huge boosts used on both L6 and L60 versions. - I used an script to replace all boosted damage (like Extra damage 2.5x) is replaced with a leveled physical damage perk, similar of what ROTE use with most of the boosted NPCs. Takes into account SIC difficulty to tune damage a bit, also reduces a bit the damage from ranged and two handed weapons. - Used another script to replace the SIC magic boost perks and elemental augments with a similar leveled elemental damage perk, that affects only elemental/poison spells. - Also script-replaced all unarmed damage perks with a single +15 one, and adjusted the damage with the leveled physical damage perk. - Added the NPC stats controller perk to many creatures that have huge health pools but didn't have the controller perk. Also added leveled elemental and physical damage perks to creatures with at least L15 that didn't have any damage boost. - All giant-based creatures got their damage adjusted (mostly reduced), also reduced some giant weapons with absurd damage. Giants Still cause really big damage and can 2h-3h KO you when they are around your level. - Tested most SIC creatures and made minor tweaks here and there to adjust or fix some creatures, specially dwemer mechanical mobs. - A few straight unfair skills have been adjusted, like the Stagger shout from the tonal architects weapon that could be recast every 2 seconds (SIC) or the 30% frozen chance from the frost spiders attack that could easily frost-lock you (ROTE). ROTE - SIC Advanced Patch - Some tweaks to SIC monsters for a more streamlined experience. Wow-like Food Overhaul - (Spanish version) - I found a fitting place for the useless food!! Check it how it works here. Elemental Enchants Fix - (Spanish version) - Fixes elemental damage specially on chaos weapons. power instead of reduced costs for a better magic experience. Smithing perks coverage - Smith perk boosts to every item from vanilla skyrim avoiding bugs and tedious setups. Triple wallets - (Spanish Version) - All merchants with at least triple gold with related perk modifications, aiming for balance.